This year marks the 60th anniversary of the ascension to the British throne (and, by extension, the crowning as Queen regnant of British Commonwealth countries including Canada) of Elizabeth Alexandra Mary Windsor, also known as Queen Elizabeth II. A long reign by any standard, our Queen is now the second longest-serving British monarch in history, bested only by the record of 63 years, 216 days set by her great-great-grandmother Victoria (1837–1901). In commemoration of the Diamond Jubilee, this article summarizes some of the connections—it makes no claim to be comprehensive—between Her Majesty the Queen and Manitoba. 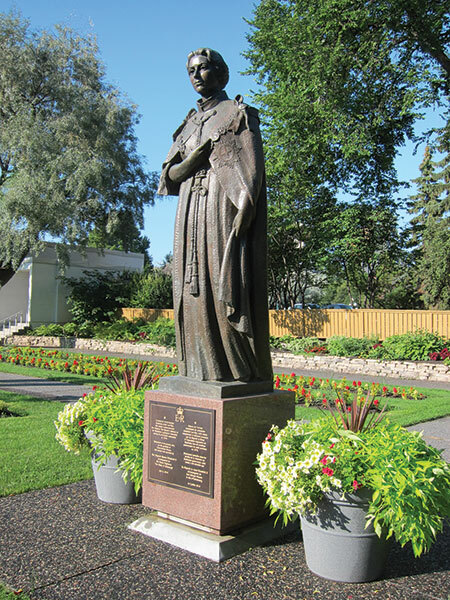 A statue of Queen Elizabeth II in the gardens adjacent to Government House was sculpted by Manitoba artist Leo Mol in commemoration of Her Majesty’s address to the Legislative Assembly during the provincial centennial in 1970. Originally situated at the Centennial Concert Hall, the statue was relocated to its present site in 2010. It was unveiled by the Queen and Prince Philip, during a Royal Visit to Winnipeg, on 3 July 2010. Institutions wishing to have the word “Royal” in their names are evaluated by the Department of Canadian Heritage before a recommendation is made to the Governor General. The decision on whether the prefix is granted is ultimately made by the Queen. To be given the prefix, an institution must be: a) preeminent in its field, b) in a secure financial position, c) established for at least 25 years, d) devoted to artistic, scientific, charitable, or sport objects, e) a non-profit organization under the Income Tax Act, and f) a provider of services on at least a regional basis. Institutions retain the prefix beyond the life of the monarch who conferred it. Five Manitoba institutions have received the Royal prefix from Queen Elizabeth II: Royal Winnipeg Ballet (1953), Royal Manitoba Winter Fair (1970), Royal Manitoba Yacht Club (1981), Royal Military Institute of Manitoba (1982), and Royal Manitoba Theatre Centre (2010). Founded in 1939 by British dancer/choreographers Gweneth Lloyd (1901–1993) and Betty Farrally (1915–1989), the Winnipeg Ballet would become Canada’s premier ballet company and, in time, the longest continuously operating ballet company in North America. The Royal Manitoba Winter Fair began in March 1908, building on the success of summer fairs that had been held annually at Brandon since 1882. They operated independently until 1967 when the two fairs were amalgamated under the umbrella of the Provincial Exhibition of Manitoba. The winter fair received the prefix during the 1970 Royal Visit and the first fair bearing the new name was held in March 1971. The Manitoba Yacht Club was founded in September 1956, making good on a Second World War boast that “all the best sailors came from the land of the wheat fields.” Its first Commodore was Gilbert M. Eaton, the Winnipeg scion of retail merchant-king Timothy Eaton. It gained the Royal prefix in 1981. The Club marked Her Majesty’s Diamond Jubilee with a 20-boat flotilla that sailed from its clubhouse along the Red River, north of Winnipeg, to the Legislative Building on the Assiniboine River. Known as the United Services Institute of Manitoba when it formed in late 1945 as a successor to the Western Canada Military Institute, membership was open to officers and ex-officers of the three armed services. Its aim was to “encourage, promote and further interest in Canadian military issues.” After gaining the Royal prefix in 1982, the organization became the Royal Military Institute of Manitoba. Institutions with Royal patronage do not necessary bear the word “Royal” in their names. They make application to Canadian Heritage which provides a recommendation to the Governor General who, in turns, makes recommendation to Her Majesty. Criteria used in making these recommendations include: a) the institution should have been in operation for at least five years, b) it should be in a secure financial position, c) the patronage should not be associated with any fundraising campaign, d) the basic objectives of the institution should be worthy of encouragement, and e) the institution should be national in scope. Institutions do not retain patronage beyond the life of the Royal family member who conferred it. At present, there are several national institutions operating in Manitoba for which Queen Elizabeth II is the patron, but only one is based in the province: St. John’s Ravenscourt School, for which patronage was conferred in 1981. It was formed in 1950 through the merger of St. John’s College School, with roots going back to the 1820s, and Ravenscourt School, founded in 1929. The private school occupies a campus in south Winnipeg. Her Majesty has visited Manitoba six times, once as Princess (1951) and five times as Queen (1959, 1970, 1984, 2002, and 2010). The latest two Royal visits to Manitoba have been of relatively short duration. The Golden Jubilee visit occurred on 8-9 October 2002 with stops at several sites in Winnipeg: 17 Wing Winnipeg, The Forks, Minto Armoury, and the Legislative Building. In 2010, a Winnipeg visit for a few hours on 3 July involved stops at Government House and the future site of the Canadian Museum of Human Rights. 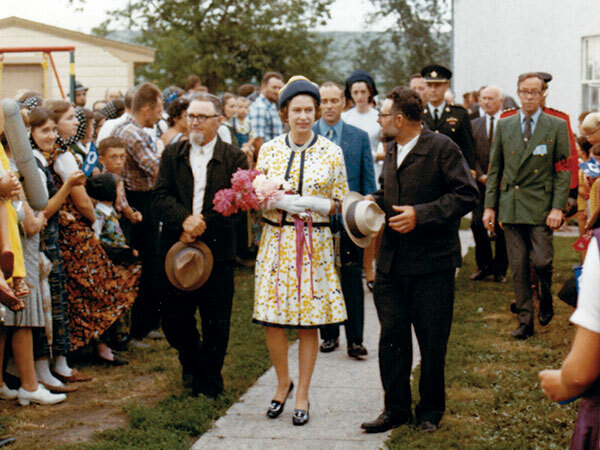 Queen Elizabeth II tours a Hutterite colony at Benard during her 1970 visit to Manitoba. 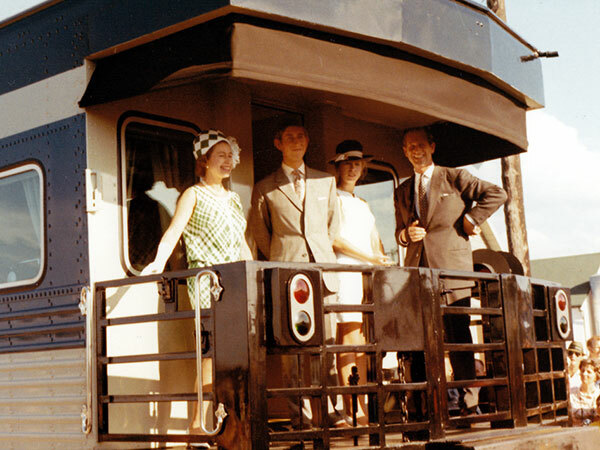 In 1970, Queen Elizabeth II travelled by train through southern Manitoba with her husband Prince Philip and two eldest children Prince Charles and Princess Anne, seen here at Brandon. 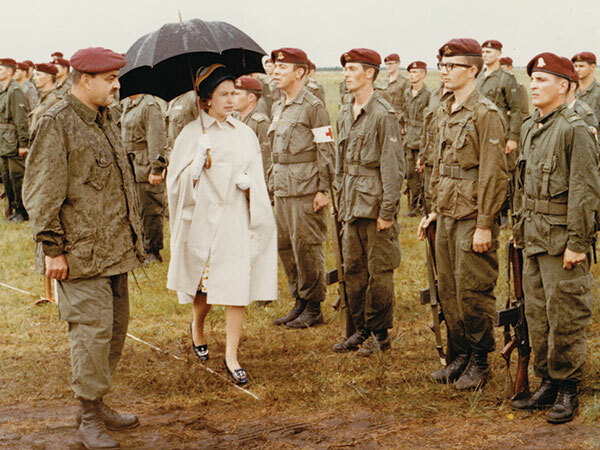 Queen Elizabeth II inspected Canadian troops at CFB Shilo during her 1970 visit to Manitoba. There are several places in Manitoba whose name derives from a member of the Royal family but not necessarily Queen Elizabeth II. For example, Royal Road in Portage la Prairie (and probably other Royal Roads elsewhere in Manitoba) was named in 1939 during a visit by King George V and Queen Elizabeth I. Some structures named for the reigning monarch no longer exist or have been renamed. The Princess Elizabeth Hospital, opened in Winnipeg in 1950, is now part of the Riverview Health Centre. Princess Elizabeth Public School, opened at Shilo, Manitoba in 1951, was later closed and demolished in early 2011. Winnipeg’s Queen Elizabeth School, now a French immersion facility, was renamed École Henri-Bergeron in 1998. The Queen Elizabeth II Music Building is situated at Brandon University. A section of Main Street in Winnipeg was named Queen Elizabeth Way in commemoration of the 2002 Royal Visit. There is a Queen Elizabeth Avenue in Erickson. The Order of the British Empire (OBE) was the highest honour that could be conferred on a Canadian citizen, prior to the establishment of the Order of Canada in 1967, typically for exemplary military service, but sometimes for civilian activities. Queen Elizabeth II has made a few Manitobans (or former Manitobans) members of the OBE. Canadian can no longer hold knightships but at least four Manitobans have been inducted into the Royal Victorian Order, the highest British honour for which Canadians are eligible. Most of the RVO appointments have been made during Royal Visits. At notable milestones during the reign of Queen Elizabeth II, the Canadian federal government has given commemorative medals to students, members of the military and police services, and others in recognition of their meritorious public service. Statistics on the number of Manitobans who have received these medals are incomplete, but several received the Coronation Medal in 1953, at least 959 received a Silver Jubilee Medal in 1977 and at least 1,672 received a Golden Jubilee Medal in 2002. This year, several Manitobans have already received the Diamond Jubilee Medal but a total will not be known until 2013. Queen Elizabeth II owns at least three paintings by Manitoba artist Wilfred Roy Corbett (1910–1997), two of which hang in Windsor Castle. Commemorative ninebark. 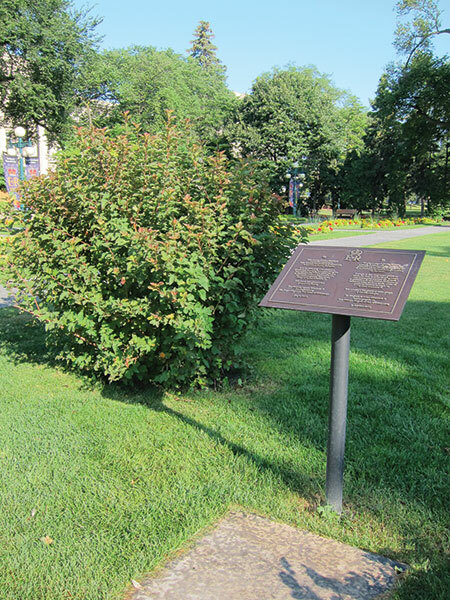 During the 2010 Royal Visit to Winnipeg, Queen Elizabeth II planted an Amber Jubilee Ninebark (Physocarpus opulifolius ‘Jefam’) in the garden adjacent to Government House. The shrub, developed by Jeffries Nurseries of Portage la Prairie in honour of the Queen’s Diamond Jubilee, was among five million trees planted as part of Manitoba’s “Trees for Tomorrow” program between 2008 and 2012.